The type and amount of sweetener used. For example, you can use all honey if you'd like, or substitute molasses, which is a sweetener that would complement a graham cracker well. If you decide to try a different sweetener, keep in mind that you may need to adjust the amount of flour. The type of fat used. You could try coconut oil, lard, or tallow in place of the butter. Perhaps you'd like to try olive oil? Or even substituting half the fat with a fruit puree, like bananas or applesauce? 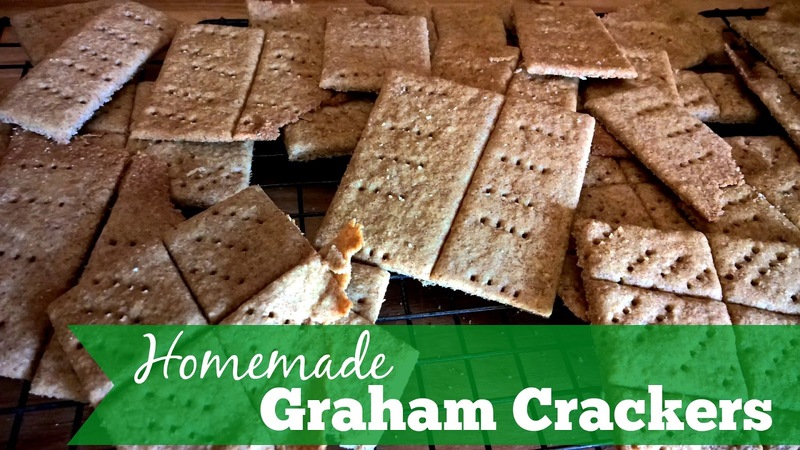 As far as the flour goes, I went out and bought some graham flour to make these crackers, but upon further investigation of the issue, have found that graham flour is pretty much the same as whole wheat flour. The difference is that the bran and germ are ground separately from the endosperm of the wheat berry. I would imagine that you could just substitute whole wheat flour for the graham flour if it is too difficult for you to find it. Will it drastically effect the taste or texture of your crackers? Honestly, I don't know, I haven't tried it, but I'd like to. I'm also interested in finding out if other types of flours could be substituted, such as rice, millet, or oat flour. The recipe itself is pretty simple--much like mixing up a batch of roll-out cookies. It took me less than an hour to make them. You can cut them into rectangles, or if you'd like to please the kids, use cookie cutters and make fun shapes. 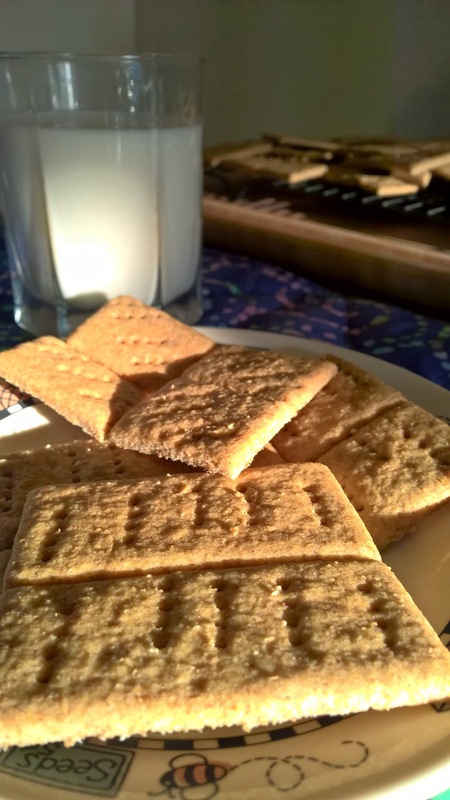 These crackers are good served with a glass of milk or a hot cup of coffee. 1. Preheat oven to 375 degrees F. Line 2 cookie sheets with parchment paper, or grease with butter. 2. Combine the first 3 dry ingredients. 3. In a separate bowl, cream the butter and brown sugar. Beat in the egg, honey, and milk. Beat in the lemon juice. Beat in the vanilla. Gradually blend in the dry ingredients. 4. Divide the dough in half. Place one half onto each cookie sheet. Roll each dough half out to a thickness of 1/8 inch. Using a pizza cutter, cut the rolled out dough into rectangles. Prick each rectangle with a fork. Optionally, you can sprinkle the dough with a cinnamon-sugar mixture if you would like. 5. Bake for 8 to 10 minutes, until lightly browned*. Cool on the baking sheets set on wire racks, and then break the cookies apart. Store in an airtight container for 3 to 4 days, or freeze for up to 6 months. 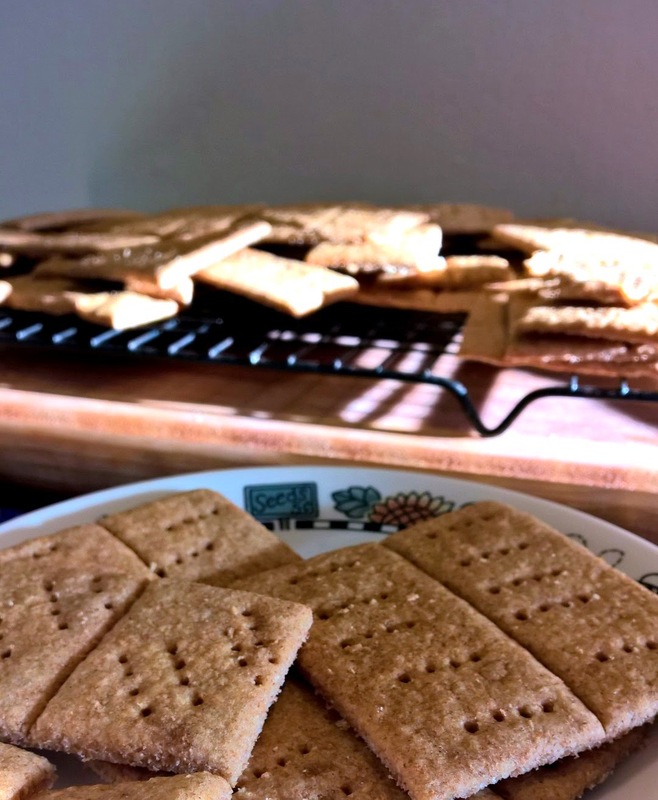 *Note: To get the crackers to be a bit more crisp, while avoiding burning them by leaving them in the oven for longer, put them on wire racks overnight to dry out a bit more. Awesome food. Thanks for sharing the recipe.